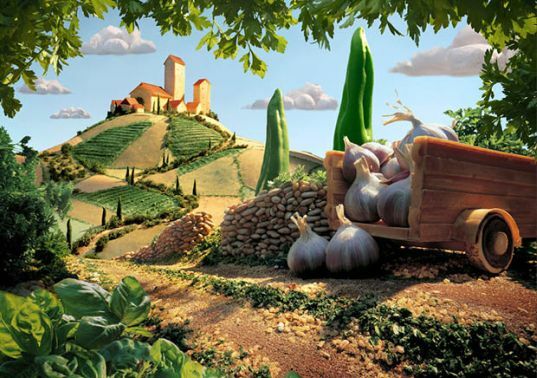 Feast on Fantastical Food Art Landscapes for Thanksgiving! This Thanksgiving, if mom is giving you grief for turning mashed potatoes into gravy-covered mountains, maybe you can get her to appreciate your handiwork by showing her these fantastical food photos. They're all the work of Carl Warner, a UK-based photographer who has spent the last ten years, well, playing with his food. But this is no mealtime distraction: each image involves the work of a team of model-makers and food artists who, in true Thanksgiving spirit, share the leftovers from each photo shoot. Read on to learn more about making breadstick piers and jalapeno shrubbery! Each shot takes several days to build, shoot, and correct in post-production. Since food, as you know, perishes, the sets have to be built in layers– otherwise the cilantro trees wilt before the garlic houses are ready. Warner begins with a sketch that is then developed by his team into the lush landscapes, that are usually built in a studio on a triangular table-top. His images have gone viral in the last few years, earning him the momentum and recognition to publish a recent book. Like Matthew Carden, he’s become known for his work with food. Yum. Each shot takes several days to build, shoot, and correct in post-production. Since food, as you know, perishes, the sets have to be built in layers-- otherwise the cilantro trees wilt before the garlic houses are ready. 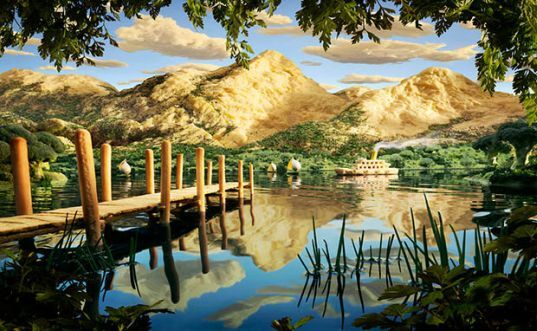 Warner begins with a sketch that is then developed by his team into the lush landscapes, that are usually built in a studio on a triangular table-top. His images have gone viral in the last few years, earning him the momentum and recognition to publish a recent book. Like Matthew Carden, he's become known for his work with food. Yum.